Karuveppilai Kozhi Kari, curry leaf flavored South Indian style chicken Curry made from fresh ground masala. This recipe is one among the series of products I shot for Ancient Cookware. The other recipes are Dindigul Chicken Biriyani, Hyderabadi Veg Dum Biryani, Village Style Chicken Curry & Mint Peanut Chutney. This Copper Handi can be used to serve biryani or curries. Those who wish to buy products from Ancient Cookware, let it be indian pots or any products from their store, can avail a discount of 5 % by using coupon code : Preeti. You need to use this code at the time of checkout. Some of the special recipes shared in my blog, Chettinadu Style Pepper Tofu Masala, Vegetarian Fish Curry, Crab Rasam, Kozhi Rasam, Mutton Biriyani & Nandu Kola Urundai. If you try any of my recipes, do share your feedback with us. 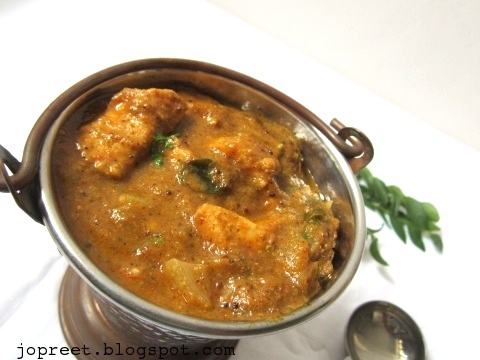 Curry leaf flavored South Indian style chicken Curry made from fresh ground masala. Marinate chicken with curd, turmeric powder, ginger-garlic paste and little salt. Keep it aside for 20 mins. Heat 2 tsp oil in a kadhai and temper mustard seeds. Add curry leaves, broken red chilies and green chilies. Saute a while. Add fennel seeds, coriander seeds and peppercorns. Cook for few mins. Add chopped onion and cook for few mins. Remove from the heat. Allow to cool and grind in a mixer grinder or food processor adding little water. Masala Paste is ready. Heat 2 tbsp oil in a pan or kadhai and temper mustard seeds. Add curry leaves and chopped onions. Saute a while. Add ground paste and tomato puree. Cook for few mins. Now, Add red chili powder, coriander powder and marinated chicken. Add salt to taste and ½ cup water or more if needed. Cook it covered on low flame for 15-20 mins. Add milk and cook for 2 mins. Remove from the heat and serve hot with rice. Love that cute mini bucket, irresistible chicken curry. Your chicken curry is lipsmacking good dear. Like this small bucket too, so pretty. Have a nice time Preeti, chicken curry looks delicious. Very delicious looking Curry, love the flavor of Curry leaves in chicken. This chicken curry must taste wonderful..I love the flavour of fresh curry leaves. We have a lot in our back yard in India. But it is hard to get good curry leaves here.. Next time when I get it will try this and let you know PT. This looks and sounds delicious! I love curry so will be giving this a try. I have a little problem with terms you are using which are not specific or undefined. When you say “Chicken B/L”, what does B/L mean? Second, please be more specific than “curds”. Little miss muffet sat on her tuffet eating her curds and whey…. is this uncreamed cottage cheese or a canned lemon pie filling or… what?